"Seek God first and prepare to build a Temple unto His Holy Name..."
These words were offered by our families in Syria to our grandparents who embarked for the United States at the turn of the century. Inspired by the loving counsel of these words, and with the visit a;nd encouragement of Bishop Raphael Hawaweeny (now St. Raphael of Brooklyn), our immigrant families were inspired to build our first church on Geneva Street. There were many difficulties to overcome for those first Orthodox families in the Geneva area. However, this sacred ambition of forming a parish and building a Temple to God was foremost in their hearts from the moment of their arrival. Some families came to Geneva in the 1880's, but most came at the end of the 19th century when the Ottoman Turks were persecuting all Christians in the Holy Land. The United States provided a safe place to raise their families and to worship without fear of persecution or death.For the first few years, they gathered regularly in various homes in the name of God and their strong Orthodox Faith. On rare occasions, a missionary priest came to administer the Sacraments. 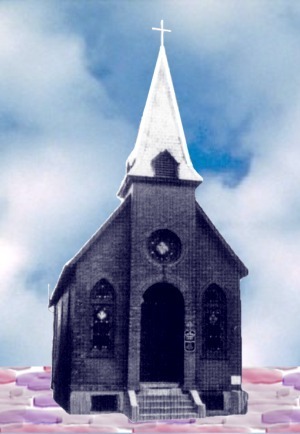 Once the families began to combine their few hard-earned dollars and, by the sweat of their brows, built the first church on Geneva Street, they were able to have a permanent Priest, Fr. Daniel George. 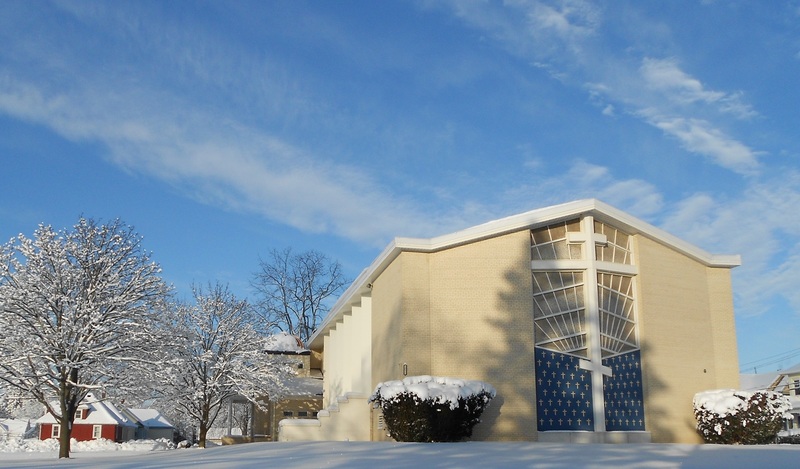 The formal organization of our parish began in 1912, and St. Michael's was formally incorporated in 1915. This was the same year that our first building was constructed and consecrated for worship of the Holy Trinity in the Orthodox Faith.For forty-three years, the parishioners worshipped at the Temple on Geneva Street. 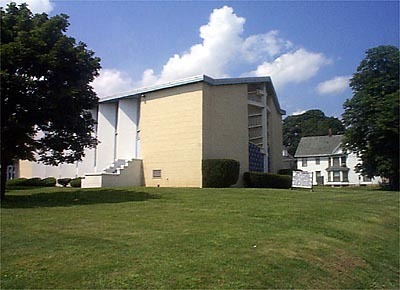 Our precious church was built next to the Geneva Fire Station, and as the city grew our site was needed for expansion. The city asked to buy the building and lot for the needed improvement of the Fire Department, and our Parish Council agreed.The last Divine Liturgy in our first Temple was celebrated on November 16, 1958. A special service of de-consecration was held, and the Holy Altar, Icons, and other sacred appointments were removed. Soon the city razed the brick building, and we were able to recover the cornerstone and the records that had been placed in it. (The cornerstone was moved to a position of honor beneath the Episcopal Throne in the Holy Place of the new Church by Fr. Murphy upon his arrival in September 2002. )At the time of the sale of our old building, the parish also owned a large house on the corner of Genesee and Lafayette Streets. The upper stories were used as a Rectory, and the ground floor was used as classroom and meeting space. 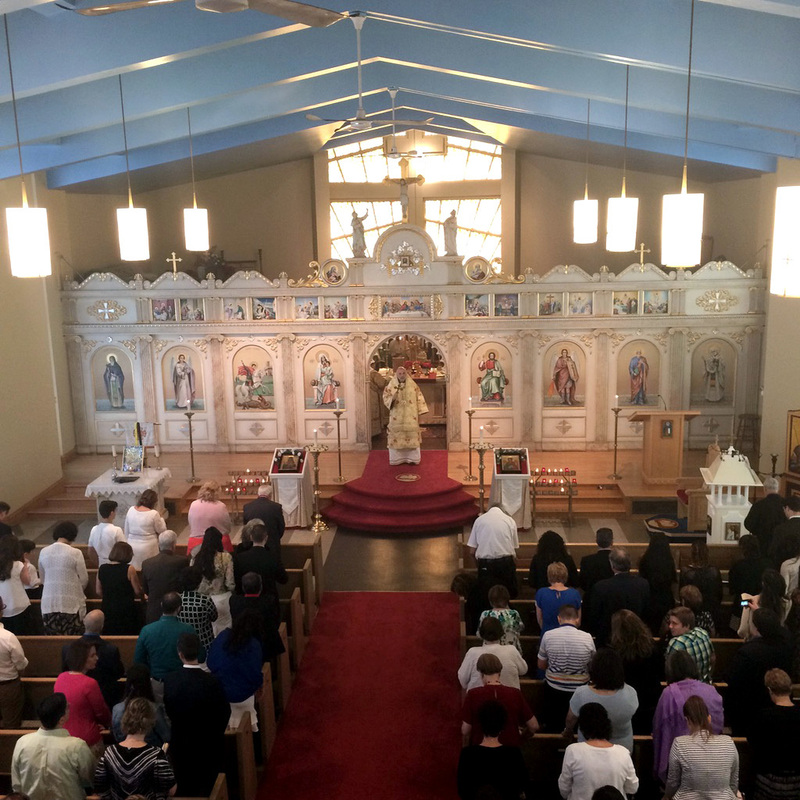 Once the old building was sold, the congregation used the first floor space to gather for the celebration of the Divine Liturgy. They met there for a year, then this building was demolished to make space for the construction of a new Temple for the worship of Almighty God. Through the kindness and generosity of the Vestry of St. Peter's Episcopal Church (located one block to the south, on the corner of Genesee and Lewis Streets), we were able to conduct our services in their parish hall during construction. This arrangement continued for two years until our new church was completed. Then, on November 26, 1961, Metropolitan Antony Bashir consecrated our new church building. A new phase in the life of St. Michael's Orthodox Church in Geneva was underway. Edited & emended from the Preface in the 75th Anniversary booklet of St. Michael's Parish (November 2-4, 1990). The first permanent pastor of our parish was the Reverend Father Daniel A. George, who came in 1912 in anticipation of the consecration of our first church. He formally became our pastor with our incorporation as a parish in 1915. St. Michael's first Deacon was ordained by Metropolitan Philip Saliba on October 5, 1980. He was a man of immense character and love. He was our beloved Deacon John Jabara. He reposed in the Lord on September 10, 1990, after a prolonged struggle with cancer. The 75th Anniversary celebration of our parish was dedicated to his memory. Rejoice, O Father Raphael, Adornment of the Holy Church! Thou art Champion of the true Faith, Seeker of the lost, Consolation of the oppressed, Father to orphans, and Friend of the poor, Peacemaker and Good Shepherd, Joy of all the Orthodox, Son of Antioch, Boast of America: Intercede with Christ God for us and for all who honor thee. Burial site of St. Raphael at the Antiochian Village Kontakion of Saint Raphael - Tone 3 Today the memory of blessed Raphael hath shone on us; For having received Christ’s call, he faithfully took up his cross and followed Him becoming a fisher of men. Let us cry aloud to him saying: Rejoice O Father Raphael! In Syria, November 8, 1860, St. Raphael was born to Michael and Mariam Hawaweeny. Like all of us he attended elementary school. Unfortunately his father was not able to afford the tuition, so the Metropolitan of Homs recommended to Patriarch Hierotheos, of Antioch, that Rafla (Saint Raphael’s name given at his baptism) be accepted as a student of the Patriarchate to prepare for the priesthood. 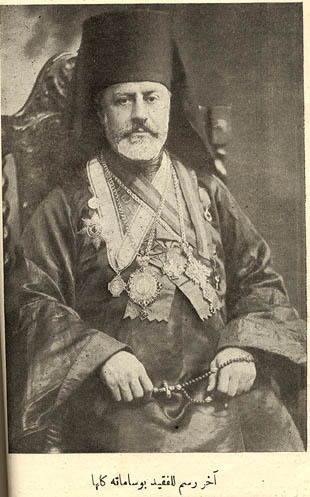 This preparation lead to his tonsuring as a monk on March 28, 1879. Fallowing his tonsuring he studied at the School of Theology at Halki. On December 8, 1885 he was ordained to the diaconate. By Bishop Slylvester, he was ordained to the priesthood in 1889. Only a month later he was raised to the position of Archimandrite. This humble man served the church in Russia for many years. November 2, 1895, Archimandrite Arrived in New York. Making several cross country journeys, seeking out the Arab-Americans of the country. Finding the lost sheep of the church he preformed marriages, baptisms, heard confessions, and celebrated Divine Liturgies in the homes of the faithful. Being the Sheperd of the Lost Sheep, he founded 30 churches across the United States, and became know as the Shepherd of the Lost Sheep In America. 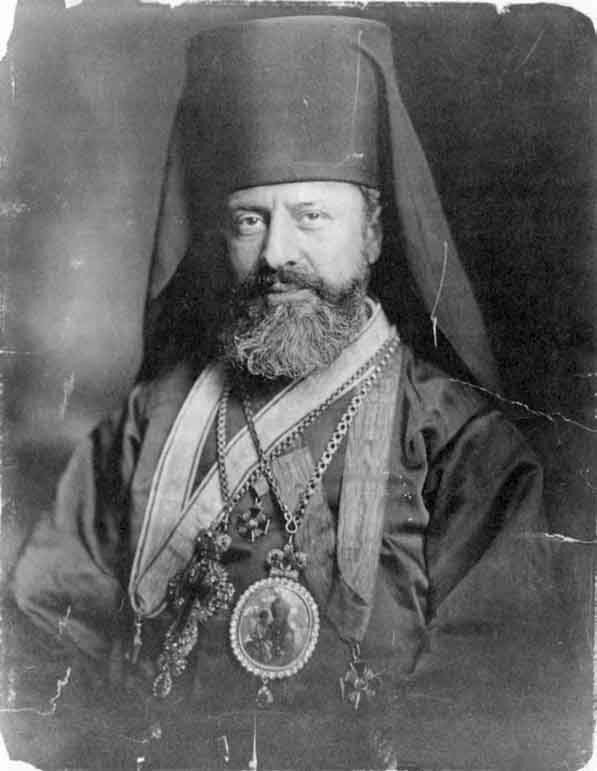 In December of 1901 Saint Raphael became the Bishop of Brooklyn and in 1904 the 1st Bishop to consecrate the American soil. Saint Raphael also founded the Word magazine (al kalimat)we read today. He died February 27, 1915 at the age of 55, from heart ailment. The wonderful man was berried in New York and then moved to the Antiochian Village Camp. March 29, 2000 his sainthood was proclaimed by the holy synod of the Orthodox Church in America. With all this in mind, we sing: "Oh holy father Raphael pray unto God for us!"